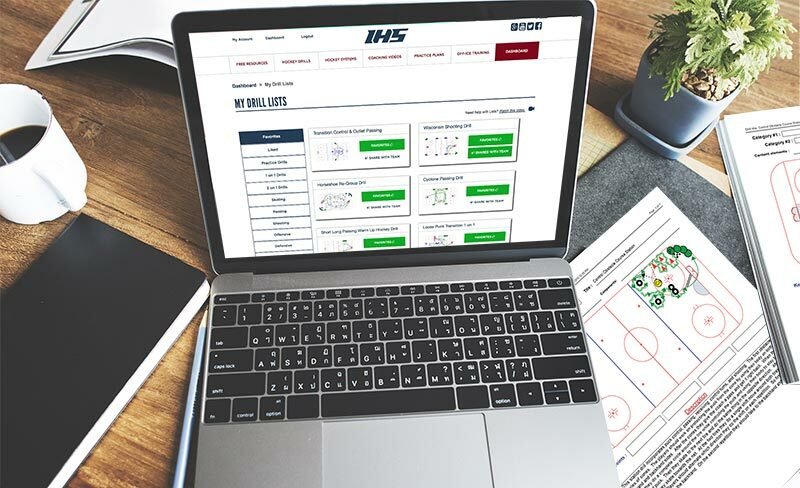 Online Tools for Youth Hockey Coaches | Ice Hockey Systems Inc. The availability of free online resources for hockey coaches has become somewhat overwhelming in the past few years. The amount of knowledge and effort for which anyone can post drill diagrams or publish videos has become so easy that the internet is flooded with more content than any coach could dream of using. Ice Hockey Systems alone has over 500 animated hockey drills and systems which is more than most coaches will ever use. Therefore Ice Hockey Systems Inc. has put a massive amount of effort in developing online tools to help coaches find, organize, and share this content. These tools are discussed below along with a video tutorial that demonstrates how to use each one. One concept we like to encourage is that all teams are different and that a recipe for one team may not be a good recipe for another team. Within an underlying structure of a program coaches need to be able to tailor the practices (and systems) to the needs of an individual team. Good coaches will pay close attention to what works well and what types of things their players respond to. It may differ from previous teams and it is important for coaches to latch on to what works for their team in the current season. Many programs try to dictate specific practice plans, systems, and drills throughout their program and while the intentions are fantastic, coaches will have more success if they find what works within the underlying curriculum and are given the freedom to use what works best for their team. The tools provided below can help coaches do exactly this by organizing and creating content that they feel is good for their team, then sharing it with them. So let’s introduce the first tool which helps a coach organize drills in their own way. Drill lists allow coaches to organize content in their own way using the drill lists provided by Ice Hockey Systems. When a coach finds a drill they like they are able to instantly save it into as many lists as they like. When they visit their drill lists page they can use the tabs to sort through their drill lists rather than search for a drill every time they would like to access it. Below is a demonstration of how easy it is to save drills into the lists and access the drills that are saved into them. Once coaches have a good library of drills in their lists then the drill lists page becomes their “go to” for finding and sharing content. Coaches are allowed to upload their own drills into their account as an image or df diagram. Once uploaded, the drills can be used in the same way as any drill provided by Ice Hockey Systems. This means they can be saved into lists, added to practices, and shared with their team. When viewing a practice, drill, or system click the “Add” button in the left column to add the drill to any of the practices you have created. So once you have created and organized all of this great content what do you do with it? You share it with your fellow coaches and players! Once team access is set up our team access tool allows coaches to share practices, drills, and systems with the click of a button. Your team can simply login to view the content you have shared to your team account. Now your team can come to practice a little bit more prepared. Most coaches like to have a physical notebook so we have provided some resources for this as well. Coaches can download documents that are very useful for practice sheets and statistics. We have multiple formats for practices as well as a couple formats for taking different types of statistics. This is a completely free resource and can be found by clicking the button below. Having access to a lot of content is great but being able to organize, create, and share it is even better. We are striving to help youth hockey coaches become more prepared and organized with better content. Coaches have such a large role in developing our young hockey players. Coming to practice more prepared with higher quality content will only benefit the development of our young players. Please let us know if you have any questions or comments and feel free to post any of them below.